Purpose: We reviewed the clinical experience of using the ureteral tumor stent (Bard®, angiomed UROSOFT) in the National Taiwan University Hospital. We focused on the efficacy and durability of the ureteral tumor stent. Materials and Methods: We collected the patient data from April 2013 to 2014. A total of 94 patients with 157 ureteral units which received ureteral tumor stent in the National Taiwan University Hospital were enrolled. We analyzed the effectiveness according to the hydronephrosis grading. The durability was counted if it did not match any of the failure criteria including the following: 1. Hydronephrosis upgrade, 2. Serum creatinine elevated over 150% of baseline, 3. Ipsilateral percutaneous nephrostomy insertion or failure to remove it after antegrade insertion, and 4. Replacement due to clinically significant symptoms. Results: In general, 65% hydronephrosis downgrade, 25% remained stationary without severe hydronephrosis, while only 10% deteriorated or remain severe hydronephrosis. The median durability was 6.8 months. The bacteriuria and size of the ureteral tumor stent were the significant factors about the durability in single variant analysis. Conclusion: The ureteral tumor stent would improve the obstructive uropathy and persist functional for an average period over half a year. Ureteral stent is a usual option to manage ureteral obstruction. However, for some patients, a regular polymeric double J (DBJ) stent might be not effectively against the obstruction due to severe stricture or external compression. Especially high stent failure was noted in those with malignant extrinsic compression such as gynecologic or lower gastrointestinal cancer. Some strength-enforced ureteral stents were developed to solve this problem.,, These kinds of ureteral stents mostly used metallic component instead of polymeric. The inserting technique was more difficult than polymeric ureteral stent due to lack of intrinsic lumen. It was usually necessary to use fluoroscopy during the procedure. The ureteral tumor stent (Bard ®, angiomed UROSOFT) was a generally polymeric stent with enforced middle part [Figure 1], between the two radio-opaque rings]. There was an intrinsic lumen, so it could be inserted as regular polymeric ureteral DBJ stent without the aid of fluoroscopy. On the other hand, the manufacturer announced less biofilm formation than the conventional DBJ, which could increase duration up to 1 year. Since there was so many factors in the real world than the experimental environment, we reviewed our clinical experience in the National Taiwan University Hospital to see the efficacy and durability of this kind of ureteral tumor stent. We retrospectively reviewed medical record of the patients receiving ureteral stenting with the tumor stent (Bard ®, angiomed UROSOFT) from April 2013 to 2014. The IRB case number was 201208052RIC. Patients either received antegrade or retrograde methods were all included in the review. Patients' characteristics, including gender, age, underlying diseases, previous radiotherapy, operation history, previous ureteral stenting, tumor stent size, and laterality, were all recorded for analysis. Bacteriuria was defined as >1000 colony-forming unit (CFU) in a catheterized urine culture or a midstream urine culture by male patients or >100,000 CFU in a midstream urine culture by female patients. There was no universal indication for the ureteral tumor stent insertion or replacement for conventional DBJ. As the manufacturer announced, the tumor stent provided stronger strength against obstruction and less biofilm formation which increased the duration. Most physicians selected it for severe obstruction or those patients who were not feasible or not favor frequent replacement procedure. We clarified the hydronephrosis grade into non, mild, moderate, and severe according to the Society of Fetal Ultrasound grading system, by sequential image study, either ultrasound, computed tomography, or magnetic resonance imaging, which was performed within 3 months (over 80% were within 1 month) after the procedure. The serum creatinine before the procedure day was assumed to be the baseline. The follow-up period was till the stent failure; the patient expired or lost follow-up. The endpoint of the study was to evaluate the effectiveness and durability of tumor stent. 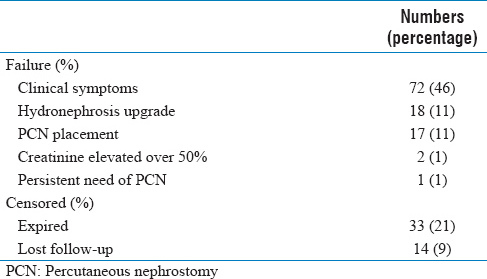 The criteria of tumor stent failure include upgrading hydronephrosis, creatinine elevation >50% than baseline, ipsilateral percutaneous nephrostomy (PCN) placement, persistent need of PCN, and tumor stent replacement due to clinically significant symptoms (such as flank pain, lower urinary tract symptom, gross hematuria, or symptomatic urinary tract infection [UTI]). Patients who expired or lost follow-up were censored on the date of the last visit. The durability was calculated with Kaplan–Meier curve. T-test was used for single variant analysis. There were 94 patients who received the ureteral stent from April 2013 to April 2014. The patient age was from 17 to 89 years old, and the mean age was 59.4 years old. There were 56 female patients and 38 male patients. About two-third of them received prior abdominal or pelvic surgery. About one-third of them received prior radiotherapy to the abdominal or pelvic lesion. More than 90% of the ureteral obstruction etiology was related to malignancy. 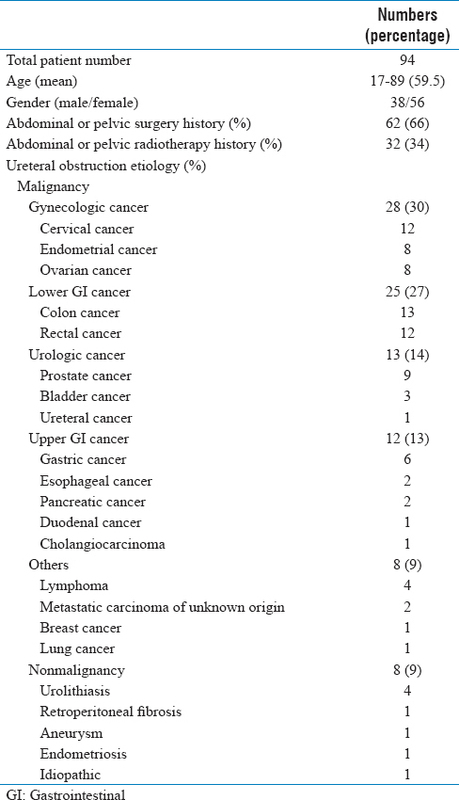 Gynecologic cancer was the most prominent (28 patients: 12 with cervical cancer, 8 with endometrial cancer, and 8 with ovarian cancer), followed by lower gastrointestinal cancer (25 patients: 13 with colon cancer and 12 with rectal cancer). Urologic cancer and upper gastrointestinal cancer both occupied about half the amount of prior two leading cancers. 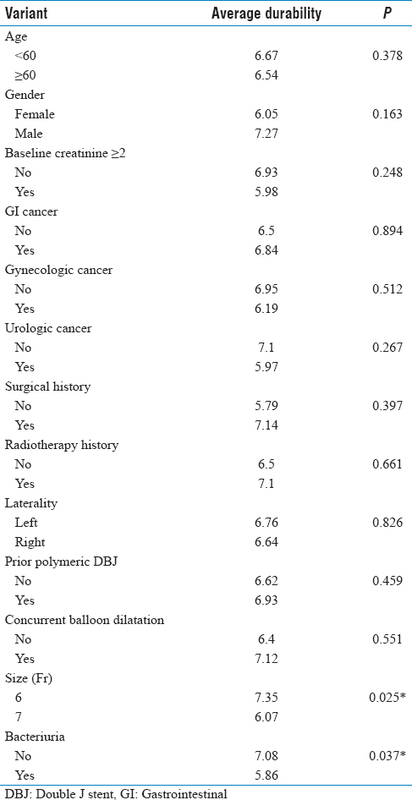 The patient demography was showed in [Table 1]. A total of 157 ureteral stents were used. The right side was slightly more than the left side (55% vs. 45%). About three-fourth were placed by retrograde method, and the other one-fourth were placed by antegrade method. The detailed size and length were shown in [Table 2]. Hydronephrosis grade before and after the procedure was analyzed. Some patients who expired or lost follow-up before the re-evaluation were excluded. For patients with prior mild hydronephrosis, 27% improved to no hydronephrosis, 69% stationary as mild hydronephrosis, and only 4% deteriorated to moderate hydronephrosis. For patients with prior moderate hydronephrosis, 27% hydronephrosis disappeared, 39% downgrade to mild hydronephrosis, 30% stationary as moderate hydronephrosis, and 3% deteriorated to severe hydronephrosis. For patients with prior severe hydronephrosis, 27% hydronephrosis disappeared, 37% became mild hydronephrosis, 18% became moderate hydronephrosis, and 18% remained severe hydronephrosis. In general, 65% hydronephrosis downgrade, 25% remained stationary without severe hydronephrosis, while only 10% deteriorated or remain severe hydronephrosis. The details are shown in [Table 3]. According to the failure criteria listed in Material and Method, the mean effective duration of tumor stent was 6.823 months (6.079–7.566). The Kaplan–Meier curve was shown in [Figure 2]. The reason for failure or censored is listed in [Table 4]. Single variant analysis was used to evaluate the risk for durability. There was no statistical significance by age, gender, baseline renal function, underlying disease, prior surgery or radiotherapy, laterality, and concurrent balloon dilatation. 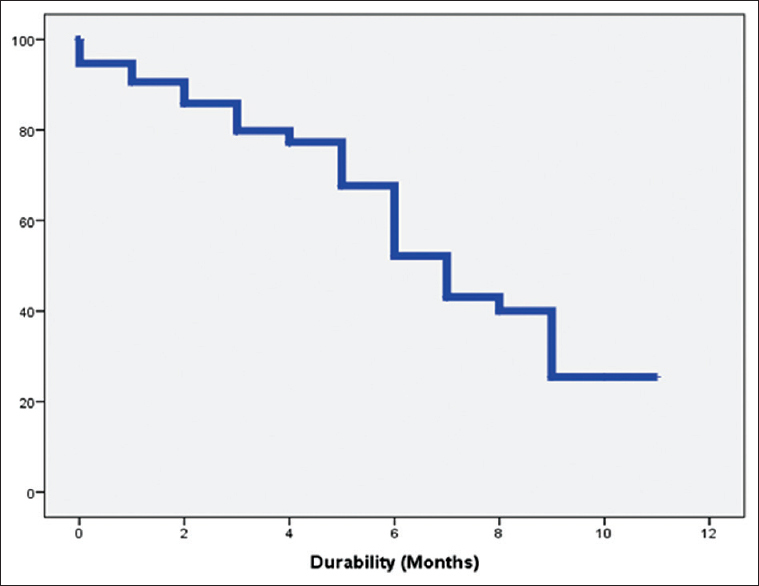 However, a 6Fr tumor stent had significantly longer durability than 7Fr tumor stent (7.35 vs. 6.07 months, P = 0.025). Bacteriuria had a significant negative effect to tumor stent durability (7.08 vs. 5.86 months, P = 0.037). The details are shown in [Table 5]. In this study, there were 41 fresh ureteral units, which mean there was no prior stent in the ureter; while there were 53 ureteral units which shift from conventional DBJ to the tumor stent. Among the fresh group, 24 (59%) of them got severe hydronephrosis when first presented. High cannulation failure rate (54%) through retrograde method was also noted in the fresh group. 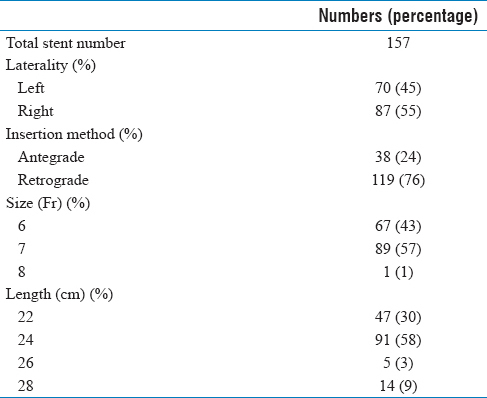 Among the crossover group, 22 (42%) of them still got moderate or severe hydronephrosis under conventional DBJ; 14 (26%) of them need PCN even under conventional DBJ. There were 25 (47%) of the crossover group experienced more than twice conventional DBJ stenting. The reasons for conversion were: severe obstruction, conventional polymeric DBJ failed or to reduce the frequency of replacement procedure. In our study, the smaller sized stent (6 French) had a longer durability compared to the larger one (7 French). This probably caused by the selection bias of a retrospective study. For the patient with more severe ureteral external compression or repeated intrastent obstruction, the operator would tend to use a larger sized stent. In prior study, bacteriuria had high correlation with the ureteral stent colonization and biofilm formation. This might cause intrastent obstruction or clinically significant UTI. Thus, the physician would remove or replace the ureteral stent in a shorter period than those without bacteriuria. Treating the preexisting bacteriuria before the ureteral stent insertion probably attributes to more durability. The metallic stent was not reimbursed, and the patient was charged about four times (32,000 NTD) compared to the ureteral tumor stent in our study (8000 NTD). Also, as mentioned above, it was often necessary to use fluoroscopy during the metallic stent insertion, which means more radiation exposure to the patient and staff. The ureteral tumor stent seemed to be a good alternative of the metallic stent. There was much more research about the metallic stent, but the patient number of each study was usually less than half of our study. Although we did not conduct a head–to-head comparison, we got some experience of patients who crossed the metallic stent and ureteral tumor stent. The metallic stent was substituted by the ureteral tumor stent for economic concern in the National Taiwan University Hospital since April 2013. There were 25 patients in this study who was previously under a metallic stent and shifted to ureteral tumor stent. There were 11 (44%) patients experienced hydronephrosis downgrade after this; 11 (44%) patients had stationary hydronephrosis grade and 3 (12%) patients got worse. However, this did not mean the ureteral stent was better than the metallic stent. It was not fair to compare a used stent with a new one. On the other hand, the underlying disease progression or further treatment such as chemotherapy might confound the ureteral obstruction condition in such cross group. There were some limitations in our study:First, it is a retrospective study. The analysis would contain some selection bias. Second, in most of our patients, the reason to replace the tumor stent was clinical symptoms. However, the stent was not reimbursed by our National Health Insurance at that period. The patient was charged 8000 NTD for one stent compared to the regular ureteral stent which was reimbursed by the National Health Insurance. This may let the physician and patient to maintain the stent. Hence, the time to replacement was affected by both medical and paramedical factors. Further prospective study was necessary to clarify these questions. For malignant ureteral obstruction, the ureteral tumor stent is an efficient option which could improve the obstructive uropathy in about 60% of patients and maintain about 6.8 months in average. Preexisting bacteriuria may shorten the durability. Docimo SG, Dewolf WC. High failure rate of indwelling ureteral stents in patients with extrinsic obstruction: Experience at 2 institutions. J Urol 1989;142:277-9. Izumi K, Mizokami A, Maeda Y, Koh E, Namiki M. Current outcome of patients with ureteral stents for the management of malignant ureteral obstruction. J Urol 2011;185:556-61. Reinberg Y, Ferral H, Gonzalez R, Manivel JC, Hulbert J, Maynar M, et al. 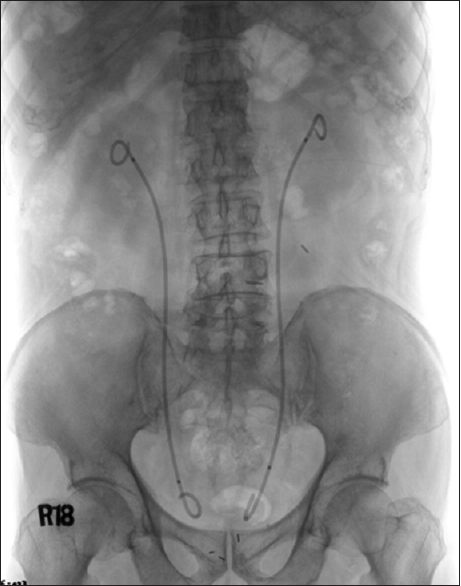 Intraureteral metallic self-expanding endoprosthesis (Wallstent) in the treatment of difficult ureteral strictures. J Urol 1994;151:1619-22. Lugmayr HF, Pauer W. Wallstents for the treatment of extrinsic malignant ureteral obstruction: Midterm results. Radiology 1996;198:105-8. Flueckiger F, Lammer J, Klein GE, Hausegger K, Lederer A, Szolar D, et al. Malignant ureteral obstruction: Preliminary results of treatment with metallic self-expandable stents. Radiology 1993;186:169-73. Fiuk J, Bao Y, Calleary JG, Schwartz BF, Denstedt JD. The use of internal stents in chronic ureteral obstruction. J Urol 2015;193:1092-100. Kehinde EO, Rotimi VO, Al-Hunayan A, Abdul-Halim H, Boland F, Al-Awadi KA, et al. Bacteriology of urinary tract infection associated with indwelling J ureteral stents. J Endourol 2004;18:891-6. Nagele U, Kuczyk MA, Horstmann M, Hennenlotter J, Sievert KD, Schilling D, et al. Initial clinical experience with full-length metal ureteral stents for obstructive ureteral stenosis. World J Urol 2008;26:257-62. Benson AD, Taylor ER, Schwartz BF. Metal ureteral stent for benign and malignant ureteral obstruction. J Urol 2011;185:2217-22. Chow PM, Hsu JS, Wang SM, Yu HJ, Pu YS, Liu KL, et al. Metallic ureteral stents in malignant ureteral obstruction: Short-term results and radiological features predicting stent failure in patients with non-urological malignancies. World J Urol 2014;32:729-36. Chow PM, Chiang IN, Chen CY, Huang KH, Hsu JS, Wang SM, et al. Malignant ureteral obstruction: Functional duration of metallic versus polymeric ureteral stents. PLoS One 2015;10:e0135566. Jaunarena JH, Cristallo C, González MS, Daels FP, De la Rosette J, Laguna MP, et al. Management of malignant ureteral obstruction. Arch Esp Urol 2016;69:507-17. Kallidonis PS, Georgiopoulos IS, Kyriazis ID, Kontogiannis S, Al-Aown AM, Liatsikos EN, et al. The full metallic double-pigtail ureteral stent: Review of the clinical outcome and current status. Indian J Urol 2015;31:8-14.